Called "GP Replica", the new Monster Art collection features colour schemes that are a tribute to Team Ducati 2011, personalised with the distinctive emblems and graphics that are the hallmarks "The Doctor" and the "Kentucky Kid". Launched in 2009, the Monster Art project was initially all about Colour Therapy, a range of vivid colours that allowed everyone to express their own particular personalities perfectly. The following year came Logomania, an extraordinary collection that paid homage to the evolution of the Ducati logo over the last fifty years. Now, directly from the racing world, comes the GP Replica collection, which introduces two new graphic designs dedicated to the official riders of Team Ducati 2011: Valentino Rossi and Nicky Hayden. 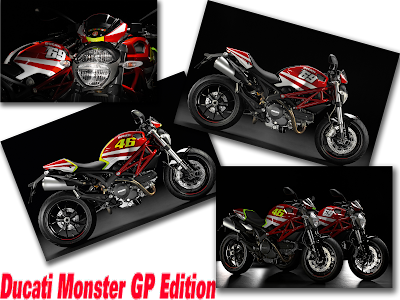 The kit, consisting of tank cover, seat cover, mudguard and nose fairing, lets you transform the livery of your Monster into a replica of the one on the Desmosedici GP11 ridden by your favourite Ducati rider. 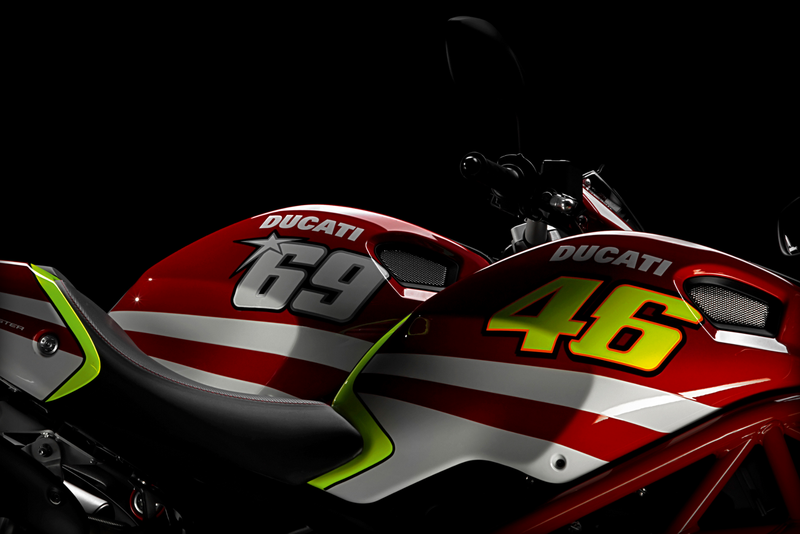 The two new color editions would make their official debut at the "Ducati MotoGP Night" at Bologna. The bike boast of the Doctor's 46 and Nicky Hayden's 69 as a major highlight of the color scheme. Both the color schemes would be available as suitable accessories for the 696, 796, 1100, 1100S and the brand new 1100EVO series of Monsters along with the original color schemes of the bikes. The grape wine is even buzzing with news that these special Monster GP Edition motorcycles would also be making their way to the Indian shores. The price has still not been announced, but the difference would be significant as per the Ducati tradition of being the premium class.